1. Put the cream, yogurt and icing sugar in a mixing bowl and whisk until thick enough to hold its shape. Carefully fold the raspberries, peaches and all but 1 tbsp of the crushed amaretti biscuits through the cream mixture, trying not to crush the berries in the process. 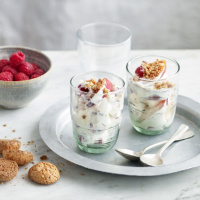 Spoon into serving glasses, cups or small bowls, and scatter with the reserved crushed amaretti. This recipe was first published in Sat Jul 01 10:50:41 BST 2017.